Here is such a cute idea, I just had to share! "Swapping was so much fun last time, let's do this again. It's the New Year and getting organized is a popular resolution. It's easy to understand why...life is so much better (not to mention "easier" and "simpler") when we are trying to be organized. I'm constantly amazed at the information I come by on the "blogosphere". There is much talent to be shared and many a tip to be passed along. 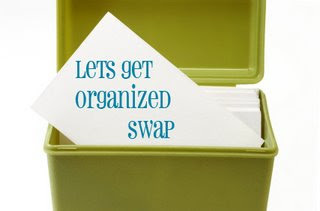 So let's do just that...let's get organized!Sounds perfect! If you're interested in further details, read here. Please note that the signup deadline is Wednesday, January 16th.